Animals and humans alike are constantly influenced by an array of environmental factors. Such elements may include other animals as well as non-living factors, such as air pressure, wind, and light. Although as many aspects as possible should be included to interpret the situation and the shark therein, some influences are more crucial than others. ADORE-SANE, the shark-human interaction concept, functions among other ways, as a tool to determine such influencing factors. The term ADORE-SANE is an abbreviation composed of the first letter of each part of the concept: appearance (attitude), direction, origin, reference, environment, situation, activity, nervousness, and experience. ADORE centers around the shark, whereas SANE primarily focuses on the physical and mental state the person is in during an encounter. ADORE-SANE has not been developed around a single species or situation. ADORE-SANE can be applied to any scenario in which a person may find himself/herself. Within the concept, this aspect needs to be largely ignored should the observer not have any experience - theoretical or practical - with sharks. ‘Appearance’ focuses on the “doing” of a shark, and how it “presents” itself. 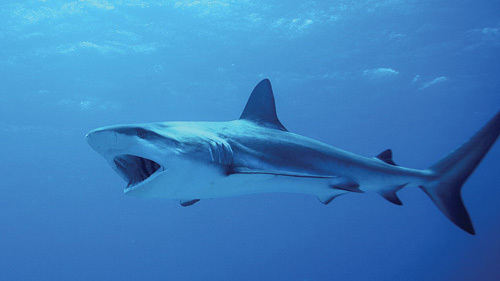 Being aware of different behaviors (e.g., a shark getting rid of a sharksucker by chafing on the bottom, yawning to reposition its jaws, gill puffing to free themselves of from food particles, tilting to encourage fishes to clean etc.) most often answers such questions right away. Once a behavior is understood - or likely so - it will be quite evident if the shark’s actions are human oriented or not. Even without proper knowledge, however, any observer can ask himself/herself questions such as “What is the shark doing or “Is there anything unusual about the shark?” to get an idea of the likely scenario. The way a shark homes in on a person indicates its intention. The more directly it swims towards a person, the more interested it likely is. 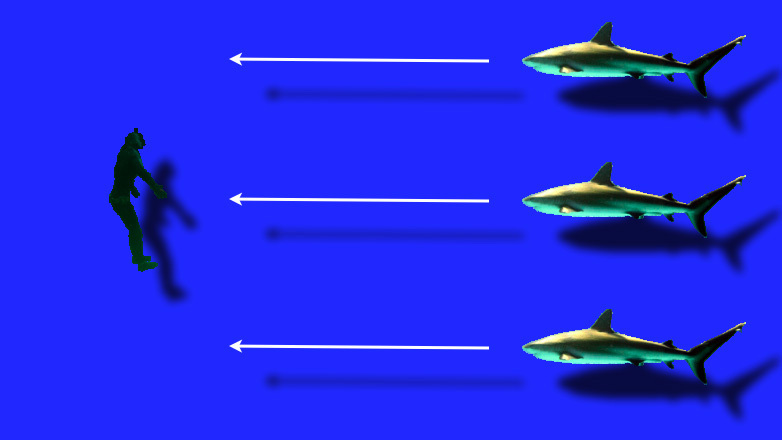 A shark generally adapts its swim direction (creating an approach angle) within the inter zone and will not adapt it any further, assuming the person does not move, until it has passed. Where is a shark first noticed? Is it at the visual limit, directly in the person’s field of vision, or immediately behind the person when he or she is turning around or when looking down? It can be surmised that a person’s presence is earlier realized by a shark than vice versa, its curiosity already heightened (assuming it steers towards the person), and respective adaptation made. 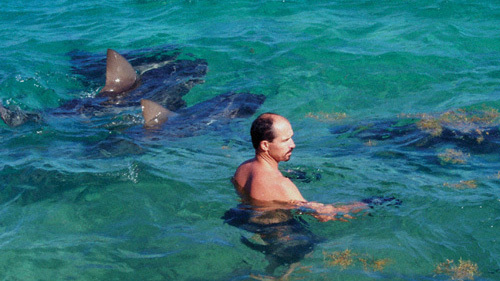 The subsequent swim pattern strongly depends on the shark’s intention during a first encounter. Whenever referring to the origin of a shark and its meaning, environmental influences should be kept in mind. 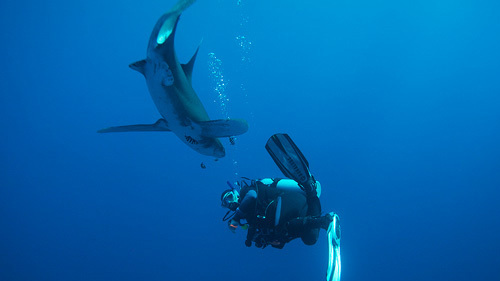 The motivation of a shark closely following a person in open water is likely different than that of a shark following a person in a tight channel. 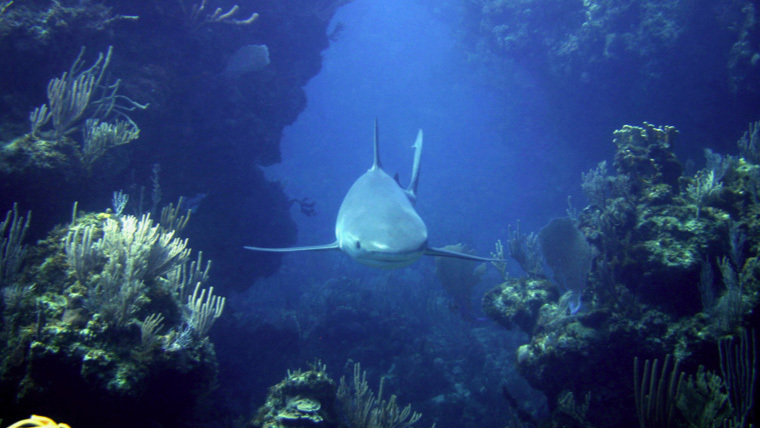 Relative to a person’s position, a shark can approach from above, on the same level, or from below the observer. 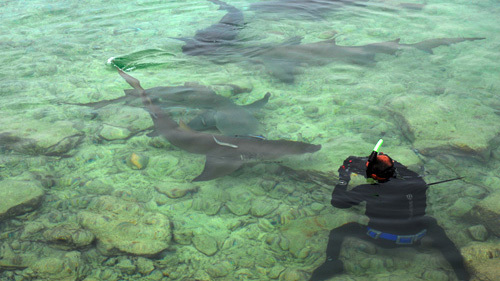 Sharks swimming below should be seen as rather cautious due to their more camouflaged position against the darker background (when seen from above). Similarly a diver stands out against the brighter background (surface). 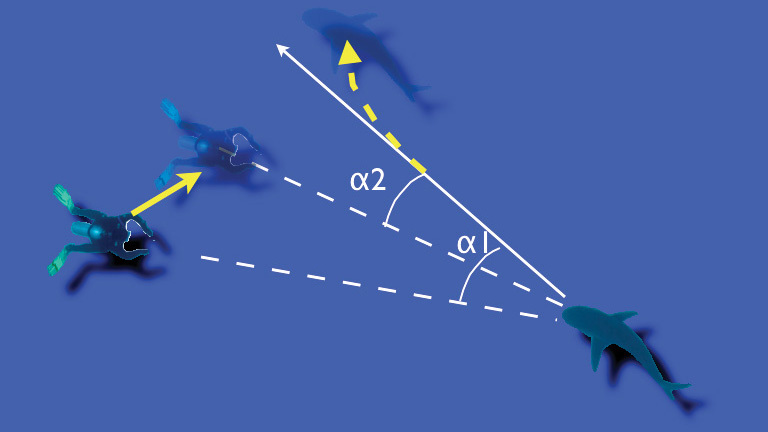 Contrarily, a shark swimming above a person seems then more comfortable with the situation, considering its disadvantage with reference to background: however, as previously mentioned, some sharks approach with the sun “behind them” to compensate for potential disadvantages. A shark closing in on the same level appears to be more relaxed, bearing in mind that it neglects the use of the background’s advantage and so remains fully visible. Not every encounter, however, takes place in open water, and topographical restrictions (shallow areas, reefs, etc.) must be considered when referencing a shark’s position. The “environment” is synonym for all factors that may influence a shark when interacting with a human being. Environmental factors include topographical structures (sandbars, channels, reefs etc. ), weather, sunlight, visibility, and artificial structures (jetties, boats, etc.). Beside such non-living (abiotical) factors, biotical ones (e.g., fishes, other sharks, other humans, etc.) also fall under this category. It is rarely possible - nor really needed - to consider all potential factors affecting a situation, and a person can most often reduce an initial assessment of a situation to topographical structures, the water’s visibility, and current. This aspect refers to the general description of what is going on right before and during an encounter. It is also a form of assessment of the surroundings themselves with or without the presence of a shark and the person’s actions. For example, a situation in which a person drifts off with a shark while interacting differs from a situation in which a diver, noting that his depth gauge is malfunctioning and becoming increasingly nervous as a result, realizes that a shark is following him. The mental state of a person always influences an interaction on different levels. 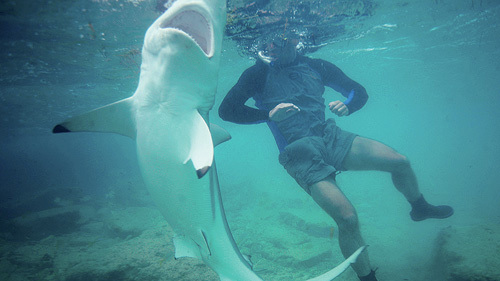 A stressed out person may act or react provocatively close to a shark, whereas a more settled person judges a potentially dangerous situation correctly and acts appropriately. At this point it remains unclear what type of information a shark truly receives from a nervous or stressed out person but ongoing research indicates that a person’s increased level of nervousness seems to have an attracting effect on sharks close to the area. 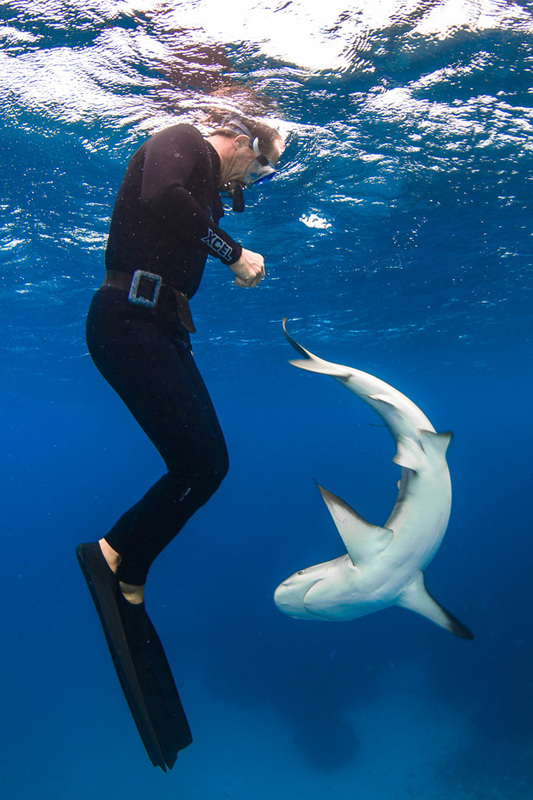 Generally two types of experience can be differentiated when interacting with sharks, one with respect to the person’s activity (e.g., experienced vs. novice diver) and the other one regarding sharks - theoretically and practically. Independent what level of inexperience there is, a situation’s assessment will be affected by both types. 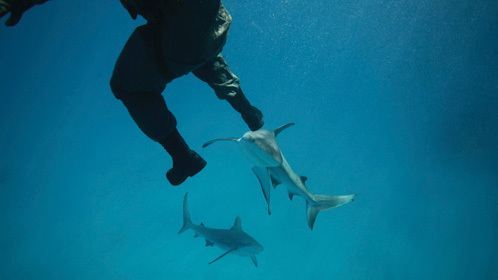 In most cases, an initial assessment of a situation can quickly be made by focusing on the shark’s swim direction, its reference to the person, and the main environmental factors. 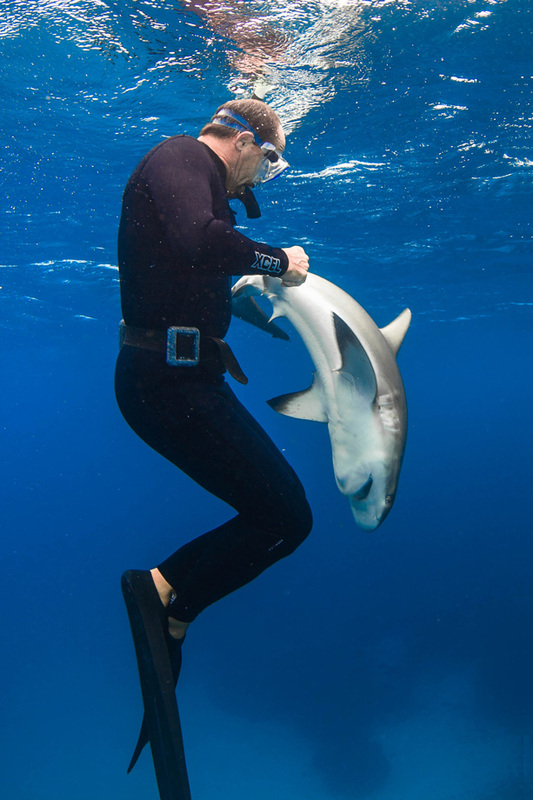 Although an absolute certainty of having correctly interpreted the situation can never be obtained (no one can read anybody’s mind to the full extent, animals and humans alike), but years of interacting with sharks and assessing situations supports this form of quick evaluation.